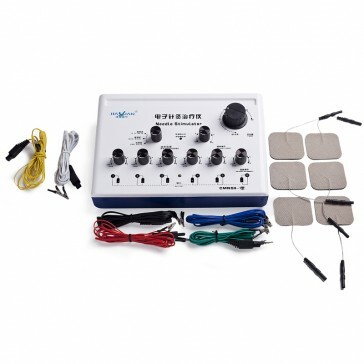 The CMNS6-1 is a beautifully crafted, high quality, durable, electronic acupuncture & TENS machine. It holds prestigious CE certification and is manufactured under quality assurance systems ISO 9001:2008 & ISO 13485:2003. Unlike most electros which have a DC (Direct Current) this electro runs on AC (Alternating Current) where both alligator clips alternate between positive and negative with each frequency pulse. This machines output is in Milliamps. The CMNS6-1 is also suitable for use in treatment of animals. We stand behind this machine with a full 12 month warranty. 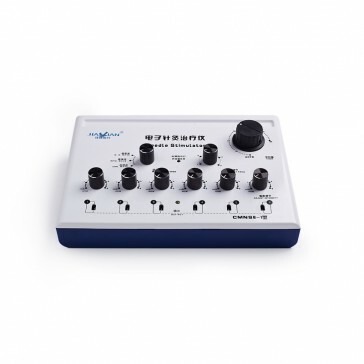 6 independently controlled output channels which provide stimulation to 2 - 12 needles at any one time. Adjustable pulse frequency: 1-100Hz (slow-fast). 3 Output pulse waveforms: Descend and disperse, intermittent, continuous. 6 x TENS pads – needle phobic? No problem! Needle free benefits of TENS pads. Electrode Cable – 3 pcs. Filiform needle electrode cable (metal clip) 6 pcs. Power Supply: AC Adaptor for AU use (output DC9V, 150mA). Or 6 x C size batteries. Tagged & Tested compliance in Australia. OVERVIEW OF DIRECTIONS 1. If using alligator clips, plug into output jack and clip ends onto needle for electro-acupuncture. 2. If using pads, plug lead wires into output jack, connect lead pins to electrodes, and adhere electrodes to patient’s target area. 3. Ensure the connected channel’s intensity knob is set to Off position. 4. Turn on the power switch at the rear of the unit. The power indicator light will illuminate. 5. Select waveform with wave selection knob (Continuous, intermediate, or dense-disperse). 6. Set the timer and output frequency as desired. 7. Turn on the channel’s intensity, and adjust.